Chronic intermittent hypoxia (CIH), the main feature of obstructive sleep apnea (OSA), is associated with hypertension. The increased of carotid body (CB) sensitivity due to enhanced sympathetic efferent may be mainly responsible for the elevation of blood pressure. Accordingly, we studied this effect of Endothelin-1 (ET-1)-induced CB chemosensory response to CIH, as a vasoactive peptide expressed in CB. The purpose of this study was to investigate the mean arterial blood pressure (MAP) and renal sympathetic nerve activity (RSNA) responses in CIH group by injecting ET-1 to directly stimulate CB chemoreceptor. Furthermore, whether ET receptor-mediated PKC and p38MAPK signaling pathway was involved in CIH-induced CB activation was also studied. Male Sprague–Dawley rats were exposed to CIH (8 h/day for 3 weeks) and the MAP and RSNA were recorded in CIH rats and Sham rats. Our results demonstrated that ET-1-induced MAP and RSNA increase were mainly mediated by ETA receptor activation in CB chemosensory after CIH exposure. Moreover, P38MAPK and PKC signaling pathway might be involved in ET-1-induced increase of MAP and RSNA in CIH group, which provided a potential therapeutic target of OSA. Wenya Li and Qi An contributed equally to this work. 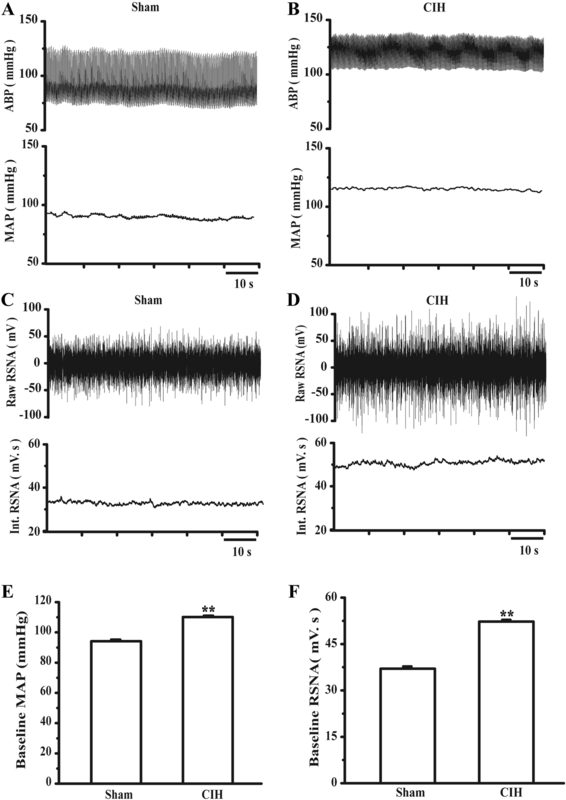 Obstructive sleep apnea (OSA), a common sleep-breathing disorder, is characterized by repetitive upper airway obstruction during sleep, resulting in chronic intermittent hypoxic and hypercapnic events (Garvey et al. 2009; Moya et al. 2016). OSA has been linked with a high risk of systemic hypertension, pulmonary hypertension, congestive heart failure and a number of other cardiovascular diseases (Bradley and Floras 2009; Pack and Gislason 2009). OSA promotes chronically the elevation of sympathetic nerve activity (SNA) and mean arterial pressure (MAP) with exaggerated sympathetic responses to acute hypoxia (Witkowski and Kadziela 2013). Experimental models of chronic intermittent hypoxia (CIH) in rats have been developed to mimic the intermittent hypoxemia associated with OSA and to determine the mechanisms underlying the CIH-induced changes of SNA and MAP (Dempsey et al. 2010; Garvey et al. 2009; Somers et al. 2008). The mechanisms that underlying CIH-induced hypertension is not fully determined, however Endothelin-1 (ET-1) is confirmed to be a directly excitable neurotransmitter to carotid body (CB) chemoreceptor and probably regulates SNA through chemoreflex (Rey et al. 2006b). ET-1 is a vasoactive peptide and is mainly expressed in the endothelium, blood vessels and CB glomus cells exposed to CIH (Atanasova and Lazarov 2016). The level of ET-1 is important in the maintenance of normal cardiovascular function, as its imbalance leads to systemic hypertension, arrhythmia and heart failure (Abukar et al. 2016; Lehmann et al. 2014a, b; Palma et al. 2002). In particular, ET-1, in the CB glomus cells, is known to play an important role in peripheral chemoreceptor activation after CIH exposure (Iturriaga et al. 2015). The CB is a polymodal peripheral chemoreceptor located in the carotid bifurcation, which plays a pivotal role in the development of the hypertension (Iturriaga et al. 2014; Kumar and Prabhakar 2012; Paton et al. 2013). CIH exposure selectively enhances the CB chemosensory responsiveness, which in turn may lead to the increase of the sympathetic discharges to the arterial blood vessels during hypoxia (Iturriaga et al. 2015). Although CIH exposure induces hypertension by upregulating the sensitivity of the CB chemoreceptor to ET-1, which in turn augments sympathetic outflow, but the mechanisms and pathway of ET-1-induced sympathetic excitation have not been adequately explored. Biological actions of ET-1 are mediated via G-protein coupled receptors designated as ETA and ETB (Goraca et al. 2016; Prabhakar et al. 2015). Although studies have indicated that ET receptors play an important role in CIH-induced hypertension, however the signaling pathway mechanism is not fully understood. P38MAPK is a subfamily of the MAPKs, which involves in a variety of cellular stress responses and its activation involves in the regulation of IH-induced NF-κB activation. 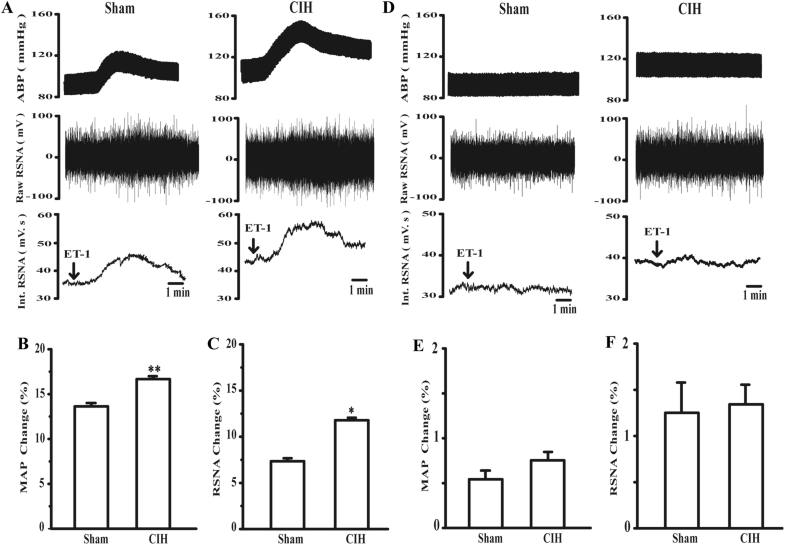 Therefore, our purpose was to investigate the mechanism of ET-1-induced sympathetic excitation on CIH-induced hypertension through modulating CB chemosensory reflex. Meanwhile we tried to explore the possible mechanisms of ET-1-induced increase in sympathetic activity after CIH exposure. We performed all experiments on male adult Sprague-Dawley rats (Hebei Medical University, Shijiazhuang, China) weighing 190–200 g at entry into the protocol. Rats were housed in standard rat cages with a 12:12 h light–dark cycle and were given food and water ad libitum. The room temperature was kept at 21–23 °C. All procedures involving animals were conducted in accordance with the Guidelines of Animal Experiments from the Committee of Medical Ethics, National Health Department of China. The rats were randomly divided into two groups (n = 30 rats in each group), including CIH group and sham group. Sham group: rats exposed to normal air; CIH group: rats exposed to CIH for 8 h/day, 21 days. ET-1 and the ETA receptor antagonist BQ-123 were obtained from Alexis Biochemicals (New York, NY, USA), whereas the ETB receptor antagonist BQ-788 was from Tocris Bioscience (Bristol, UK). P38 MAPK signaling pathway antagonist SB203580 was purchased from Sigma (St Louis, MO, USA). PKC signaling pathway antagonist chelerythine was purchased from Enzo (Raamsdonksveer, The Netherlands). ET-1 and BQ-123 were dissolved in normal saline and stored at − 20 °C. BQ-788, SB203580 and chelerythine were dissolved in dimethylsulphoxide (DMSO), with the final concentration of DMSO being less than 0.01%. Preliminary experiments showed that this concentration of DMSO had no effect on contractile responses to ET-1. The dose of ET-1 used in this study was 1 nmol/kg (seen data in Table 1), 0.5 ml. The doses of BQ123, BQ788, SB203580 and chelerythine were 0.3 mg/kg, 0.5 ml, respectively. Rats were randomly assigned to either CIH exposure or sham exposure. During CIH exposure, animals were placed daily in plexiglas hypoxic chambers that were flushed with 100% N2 to inspired O2 fraction (FIO2) nadir of 9% for 1.5 min. The FIO2 was progressively returned to 21% with 100% O2 over the remainder of each cycle. The exposure cycle was repeated every 3 min for 8 h/day, 7 days/week for 3 weeks during the animal’s sleeping hours, as described previously (Guo et al. 2013; Huang et al. 2009, 2010; Liu et al. 2009). Rats were exposed to CIH from 8:00 am to 4:00 pm. Sham group rats underwent identical handling and exposure procedures, but chambers were flushed with room air rather than N2. After completing the exposure, animals were randomly assigned to various experimental groups for physiological investigations. Animals were surgically prepared for acute experiments during anesthesia with pentobarbital sodium (25%, 60 mg/kg ip). Rats were placed on supine position and the body temperature was maintained at 37 ± 0.5 °C with a heating pad. Briefly, femoral arterial and venous polyethylene catheters were inserted for measurement of mean arterial blood pressure (MAP) and administration of drugs, respectively. A tracheostomy was performed to reduce airway resistance. The CB chemosensory discharge was measured as previously described (Del Rio et al. 2011; Moya et al. 2016; Pedrino et al. 2016; Peng et al. 2012). Briefly, the sternocleidomastoid muscles were displaced laterally, exposing the carotid sheath of the cervical fascia. At the same time, the carotid bifurcation (common carotid artery, CB and external, internal carotid arteries along with intact sinus nerve) were visualized. The effect of baroreceptors activity was eliminated by dissecting the common carotid arterial wall between the carotid sinus and the CB, and cut off the sympathetic trunk of the common carotid artery and the laryngeal nerve. Under a surgical microscope, after cleaning the connective tissue, the left common carotid artery was cannulated for drug administration. The catheter was introduced in the common carotid artery and the tip was about 0.5 cm from the carotid bifurcation for drug infusion. The drugs were infused into the common carotid artery for irrigating the CB. Surgeries were done with care by a skilled researcher using appropriate surgical tools. On the base of the above operation, the CB chemoreceptors were inactivated by cutting off the carotid sinus nerve. As described previously (Huang et al. 2009, 2010; Liu et al. 2009), the left renal nerve was exposed for recording renal sympathetic nerve activity (RSNA) under direct visualization using a surgical microscope. After careful dissection, the renal nerve was placed on a bipolar platinum–iridium electrode and covered with warm Mineral oil to prevent drying. The nerve signals were amplified (× 1000) with an AC/DC differential amplifier, band-pass filtered (300–3000 Hz), and was recorded on a PowerLab data acquisition system. Finally, rats were euthanized with an intravenous overdose of pentobarbital sodium, and RSNA was recorded for an additional 25-to 30 min period, while the recording was used as the background noise level of RSNA. The background noise was subtracted from all the integrated values of the RSNA. All data were presented as the means ± S.E.M. Comparisons between Sham and CIH groups were made using a Student’s t test on the differences assuming unequal variances. P < 0.05 was considered statistically significant. All statistical analyses were performed using SPSS13.0 (SPSS Inc., Chicago, IL, USA). After 21 days of CIH exposure, the representative tracings showed that MAP and RSNA were recorded in Sham (Fig. 1a, c) and CIH (Fig. 1b, d) rats. As shown in Fig. 1e–f, the baseline MAP and RSNA were significantly increased in CIH group compared to that in Sham group (p < 0.01 and p < 0.01). In this experiment, we examined the effect of ET-1 on the MAP and RSNA in the Sham group and CIH group (Fig. 2a–c). The representative tracings were shown in Fig. 2a. As results showed in Fig. 2b–c, when the effect of baroreceptor was eliminated, the MAP and RSNA were significantly increased in CIH group after ET-1 administration (p < 0.01 and p < 0.05 vs. Sham group). However, when the reflex of chemoreceptor and baroreceptor were eliminated, MAP and RSNA were no significant differences in Sham group and CIH group after ET-1 administration (p = 0.89 and p = 0.29, n = 6, Fig. 2d–f). These results suggested that ET-1-induced MAP and RSNA increase could be mediated through the CB chemoreceptor. To identify whether the ETA receptor was involved in modulating the effects of ET-1 on RSNA and MAP, the ETA receptor antagonist BQ123 was injected into the CB. The BQ123 alone had no effect on the MAP and RSNA (Table 2). After 15 min of incubation of BQ123, the ET-1 was administered to observe the effect on MAP and RSNA (Fig. 3). As results showed in Fig. 3a, ET-1-induced MAP increase had been greatly suppressed (p < 0.01). ET-1-induced RSNA increase had been completely inhibited, and even decreased the RSNA (p < 0.01, Fig. 3c). Moreover, the inhibition effects of BQ123 in CIH group were greater than that in Sham group (p < 0.05 and p < 0.05, Fig. 3b, d). The representative tracings were shown in Fig. 3e. To investigate whether the ETB receptor was involved in modulating the effects of ET-1 on RSNA and MAP, the ETB receptor antagonist BQ788 was injected into the CB. Also, the BQ788 alone had no effect on the MAP and RSNA (Table 2). After 15 min of incubation of BQ788, the ET-1 was administered to observe the effect on MAP and RSNA (Fig. 4). As results showed in Fig. 4a, c, ET-1-induced MAP and RSNA increase had been significantly enhanced (p < 0.01 and p < 0.01). Furthermore, the effects of BQ788 on MAP and RSNA in CIH group were greater than those in Sham group (p < 0.01 and p < 0.01, Fig. 4b, d). The representative tracings were shown in Fig. 4e. To further determine whether the P38 MAPK signaling pathway was involved in modulating the effects of ET-1 on RSNA and MAP, the P38 MAPK signaling pathway antagonist SB203580 was injected into the CB. Similarly, the SB203580 alone had no effect on the MAP and RSNA (Table 2). After 15 min of incubation of SB203580, the ET-1 was administered to observe the effect on MAP and RSNA (Fig. 5). As results showed in Fig. 5a, c, ET-1-induced MAP and RSNA increase had been partly inhibited (p < 0.05 and p < 0.05). However, MAP and RSNA were no significant differences in CIH group and Sham group (p = 0.58 and p = 0.36, n = 6, Fig. 5b, d). The representative tracings were shown in Fig. 5e. To investigate whether the PKC signaling pathway was involved in modulating the effects of ET-1 on RSNA and MAP, the PKC signaling pathway antagonist chelerythine was injected into the CB. Similarly, chelerythine alone had no effect on the MAP and RSNA (Table 2). After 15 min of incubation of chelerythine, the ET-1 was administered to observe the effect on MAP and RSNA (Fig. 6). As results showed in Fig. 6a, c, ET-1-induced MAP and RSNA increase had been partly inhibited (p < 0.05 and p < 0.01). However, MAP and RSNA were no significant differences in CIH group and Sham group (p = 0.92 and p = 0.29, n = 6, Fig. 6b, d). The representative tracings were shown in Fig. 6e. In the present study, our purpose was to investigate the mechanism of ET-1-induced sympathetic excitation on CIH-induced hypertension through modulating CB chemosensory reflex. The main findings of this study were that (1) MAP and RSNA were significantly increased in CIH exposure group by ET-1. (2) ETA-R was mainly responsible for ET-1-induced MAP and RSNA increase. (3) P38MAPK and PKC signaling pathways might mediate ET-1-induced increase of MAP and RSNA in CIH group. CB are the primary sensory organs to detect arterial blood O2 levels and regulate breathing and SNA during hypoxia via carotid chemoreflex, which plays a pivotal role in the development of the hypertension (Iturriaga et al. 2014, 2015; Kumar and Prabhakar 2012; Prabhakar et al. 2015). Except carotid chemoreflex, carotid baroreflex is another major regulator of the SNA and arterial blood pressure (Peng et al. 2012). Unlike chemoreceptors, the activation of baroreceptors inhibits sympathetic nerve activity. Some studies showed that carotid baroreflex function was down regulated in sleep-apnea patients and in rodents exposed to CIH (Peng et al. 2012; Prabhakar and Kumar 2010; Prabhakar et al. 2015). Therefore, the present study was to explore the effect of carotid chemoreceptor in rats exposed to CIH after the nerves of the baroreceptor were cut off. CIH exposure can increase the sensitivity of the CB response, and support the notion that CIH exposure resulting from sleep-disordered breathing does affect the carotid chemoreceptor activity (Del Rio et al. 2010, 2012). However, the mechanism underlying the CB sensitivity in CIH exposure is not well known. So, our present study was to examine the role of ET-1 on MAP and RSNA response to chemoreflex activation in rats exposed to CIH and the underlying mechanism. It is known that ET-1 is expressed in the CB, and induces CB chemosensory excitation and potentiates the chemosensory response to acute hypoxia (Kumar and Prabhakar 2012; Peng et al. 2013; Rey et al. 2007, 2006b). CIH exposure increased ET-1 expression in the CB and an ET-1 receptor antagonist prevented CIH-induced sensitivity of the chemosensory response to hypoxia (Pawar et al. 2009; Rey et al. 2008). A study by Rey et al. suggested that ET-1 contributed to CIH-induced sensitivity of the CB response. In addition, ET-1 immunoreactivity was increased by 10-folds in the CB from CIH-treated cats (Rey et al. 2006a, b, 2008). Furthermore, the expression of ET-1 was increased in the CB of rats exposed to CIH (Del Rio et al. 2011; Lam et al. 2006). Another study showed that intermittent hypoxia (IH) increased ET-1-induced constriction of systemic arteries via PKC-dependent vascular smooth muscle Ca2+ sensitization, which might account for elevated vascular resistance and resultant hypertension (Snow et al. 2011). Our results demonstrated that the increase of ET-1 in the CB contributed to the enhancement of chemosensory responses to CIH. It is generally accepted that the increase in arterial pressure of rats exposed to CIH is associated with an increase in sympathetic activity. A previous study showed that sustained hypoxia enhanced rat CB chemosensory responses to acute hypoxia in a time-dependent manner, and the enhanced chemosensory response to hypoxia was reversed by BQ-123 and was associated with ETA-R and ET-1 expression increase in the CB (Iturriaga 2013). However, Rey et al. found that after 4 days of CIH exposure, the expression of ETB receptor was increased in glomus cells of CB, whereas ETA receptor levels was unchanged (Rey et al. 2006a). However, another study was reported that the expression of ETA and ETB protein was increased in the CB after CIH exposure (Rey et al. 2008). Our results showed that ETA receptor antagonist BQ123 completely prevented ET-1-induced MAP and RSNA increase, whereas ETB receptor antagonist BQ788 significantly enhanced ET-1-induced MAP and RSNA increase. Furthermore, the effects of BQ123 and BQ788 on MAP and RSNA in CIH group were greater than those in Sham group. Our results indicated that ET-1-induced MAP and RSNA increase were mainly mediated by ETA receptor activation in CB chemosensory after CIH exposure. In addition, the mechanism might be that ETB receptor increased nitric oxide (NO) synthesis through endothelial NO synthase up-regulation (Rubanyi and Polokoff 1994). Thus, activation of ETB receptor might be an inhibitory effect on chemosensory discharges because NO was a tonic inhibitory modulator of CB chemoreception (Valdes et al. 2003). Therefore, ETB receptor upregulation in CIH exposure might be a compensatory inhibitory mechanism by increasing the NO synthesis and counteracting the chemoexcitatory effect of ET-1 (Rey et al. 2007). Another possibility was that ETA receptor activation led to an inhibition of norepinephrine (NE) re-uptake, resulting in an increase in net NE release, which led to an activation of the sympathetic nervous system in general (Lehmann et al. 2014b). In contrast, ETB receptor activation led to an inhibition of exocytotic NE release. In many tissues, ET-1 was bound to G-protein coupled ETA receptors to activate phosphoinositide-specific phospholipase C (PLC), which in turn produced diacylglycerol (DAG) and activated PKC (Kang and Chung 2012). PKC has been identified as an important signaling pathway in a wide variety of cell types. 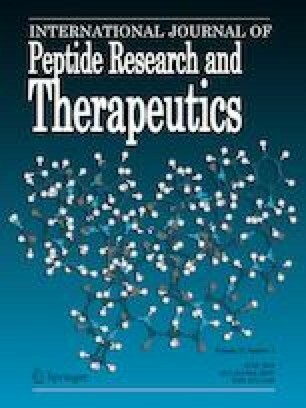 PKC is a multigene large family of serine/threonine kinases which plays important roles in signal transduction in health and disease, contributing to endothelial dysfunction, vascular permeability, angiogenesis, cell growth and apoptosis. Some studies indicated that PKCδ signaling pathway might be involved in ET-1-mediated constriction in mesenteric arteries in IH-exposed rats (Allahdadi et al. 2008; Webster et al. 2013). Nevertheless, in pulmonary vascular smooth muscle, IH could augment ET-1-induced vasoconstriction through a PKCβ-dependent signaling mechanism (Snow et al. 2011). Our study suggested that PKC signaling pathway might mediate ET-1-induced MAP and RSNA increase in CIH group, suggesting PKC signaling pathway might be involved in ET-1-induced MAP and RSNA increase in CIH group. The family of MAPKs (mitogen-activated protein kinases) plays an important role in mediating various cellular responses including proliferation, differentiation and adaptation to stress. P38MAPK is a subfamily of the MAPKs, which is involved in a variety of cellular stress responses. For example, the block of p38MAPK increased apoptosis and decreased the IH-induced NF-κB expression, suggesting that P38MAPK activation might be involved in the regulation of IH-induced activation of NF-κB as an indicator of SNA (Wu et al. 2013). Furthermore, MAPK signaling pathway contributed significantly to the excitatory neurochemical milieu driving sympathetic activity in heart failure (HF) and hypertension (Wei et al. 2016). Here we had shown that p38MAPK signaling pathway antagonist SB203580 partially inhibited ET-1-induced MAP and RSNA increase in CIH group, suggesting p38MAPK signaling pathway might be involved in ET-1-induced MAP and RSNA increase in CIH group. In summary, our results demonstrated that ET-1-induced MAP and RSNA increase were mainly mediated by ETA receptor activation of CB chemosensory after CIH exposure. Moreover, P38MAPK and PKC signaling pathways might be involved in ET-1-induced increase of MAP and RSNA in CIH group, which provided a potential therapeutic target of OSA. This work was supported by Grants from the National Natural Science Foundation of China (Numbers 30971195 and 81170069), Hebei Education Department Foundation (Numbers ZD2014043, QN2016166, ZD2014005 and ZD2017057) and the Natural Science Foundation of Hebei Province (Numbers C2011206031 and C2009001053). WL, QA, SY, YZ performed the research and analysed the data. QG, EJ designed the research study and wrote the paper. All authors report no conflict of interests.